Interesting quote from an article in the New York Times on February 11th: "In economic forecasting, research has shown that trends in increasing or decreasing volumes of housing-related search queries in Google are a more accurate predictor of house sales in the next quarter than the forecasts of real estate economists." (The Age of Big Data, NY Times, 02/11/12) This is VERY encouraging, because, as the "keeper of the website", I keep a close watch on our Analytics data--how many people are visiting our website, reading this blog, etc. Consumers typically start their home search online, so it makes sense that an increase/decrease in website activity may dictate how your performance will be in the upcoming months, right? This inspired me to do a little investigative research, and www.goodallhomes.com has had a 54% increase in visitors to our website comparing July 2011 to January 2012! If the quote from the New York Times is in fact true, this is really good news for a lot of people in middle-Tennessee! No wonder we are setting records left and right! We closed the month of January with 28 net sales, which is a Goodall Homes all-time record, and we already have 16 very happy new homeowners in the month of February! 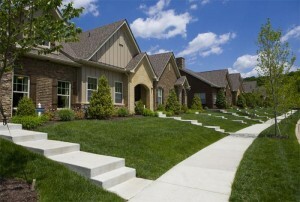 Excited about what the future has in store for Goodall Homes, as well as the Nashville area housing market!